Have the Mold in Your Basement Removed by an Atlanta, GA, Company You Can Trust – Abatement Solutions Inc. If you’ve seen signs that you may have mold in the basement of your Atlanta, Georgia, home, you’re certainly not alone. Having served realtors, developers, and homeowners in Atlanta and many nearby communities, the mold specialists at Abatement Solutions Inc. know full well how common it is to see mold growing in basements throughout the area. Mold thrives in damp, dark, poorly ventilated places, and few parts of a building provide more favorable conditions for mold contamination than a basement. 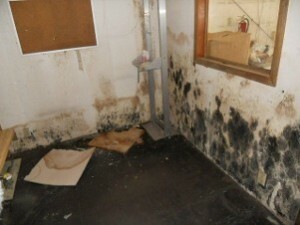 Left unchecked, basement mold can spread and cause costly damage to your property. Even worse, mold releases hazardous microtoxins, which can aggravate allergies and cause serious health conditions. Luckily, our Certified Mold Remediation Contractors have the expertise and equipment needed to ensure that your home and its occupants are safe from these threats. Our team can identify the cause of the mold growth in your basement, remove it, and prevent it from returning. For your peace of mind, we even guarantee that an independent lab will verify that mold levels in your building are at healthy, acceptable levels after our work is done. Water extraction/dry-out – Our team will use water extractors, air movers, and dehumidifiers as needed to remove excess moisture from your basement, so that the space is no longer conducive to mold growth. Containment – We’ll set up a containment barrier and use an air scrubber to filter the mold spores out of the air in your basement, minimizing the mold contamination and preventing it from spreading into other parts of your building. Cleaning – Our mold abatement team will use EPA-registered cleaners and fungicides to kill the mold growth in your basement and help sanitize the area. Removal – Severely mold-impacted items may need to be safely bagged and removed so that they won’t infect other parts of your home. Rebuild – Our staff will then rebuild any parts of your basement that needed to be demolished, returning the space to its original condition. Next, our team will apply a protective treatment to the affected surfaces in your basement to prevent the mold from returning. Contact Abatement Solutions Inc. today to eliminate the mold in your basement and have your Atlanta, GA, home safeguarded against future mold growth.